1. UFPCM loading, discharge and storage. - Damage of assembling loops is in an amount: more than one from a shorter side and more than two from the longer side of a mate. 1. Loading and discharge with a faucet is done with 4 beckets, fixed through the assembling loops of the longer side of UFPCM linen. 2. In accordance with Technical Requirements, loading and discharge of several items in pile with a faucet, fixed through the assembling loops of lower linen is possible. Not more than three UFPCM identical model scan be lifted at a time; and the carrying capacity of the lifting mechanism must be equal or bigger than the weight of the lifted load. 3. Bulk UFPCM loading is not allowed. UFPCM loading and discharge in a single item and in a pile. For storage UFPCM and UFPCM –S are set in stacks. Depending from the model a fixed number of products can be set in a stack. The allowed numbers are listed below. 1.UFPCM shipment by a railway transport. If UFPCM is shipped via railway transport it is required to follow the UFPCM placing and fastening schemes in an open wagon, asserted by JSC “RZD”. - UFPCM are laid in an open wagon in nine or ten stacks, depending on the loading scheme and open wagon type. - UFPCM loading is allowed on special metallic pallets and without them. UFPCM loading of different models in one open wagon is allowed in accordance with asserted placing and fastening loading scheme. 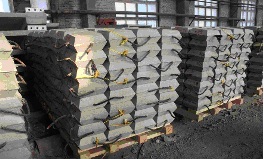 - If UFPCM are loaded without pallets, every end wall of railway open wagon must be protected with a wooden shield and additional support made from two bars. In the center of the open wagon, in case of a gap formation, a spacer cage is set, and single lying UFPCM in the top tier are tied with a 6 mm diameter wire in four threads. - IF UFPCM are loaded on pallets, beckets of pallet in every stack are inter-tied in pairs with a 6 mm diameter wire in four threads. Then stacks are tied with one another, and in the center of the open wagon a spacer frame is set. - Loading of UFPCM pallets in a railway wagon starts from the end wall of the open wagon towards its center. 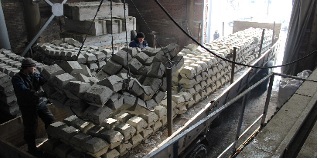 Discharge of UFPCM pallets from an open wagon starts from its center to the end wall. -Total weight of UFPCM in an open wagon must not exceed its stencil carrying capacity. If UFPCM is shipped via motor transport, the following UFPCM loading norms are used, depending from the loading capacity of a used motor transport. UFPCM loading and shipment via motor transport.